Hearing aids are the most popular type of assistive technology for children who are deaf or hard of hearing. They work by amplifying the sound signals that travel along the ear’s auditory pathway to the brain for processing. Provided that the wearer’s basic ear infrastructure is intact, hearing aids can help make these audio signals louder – enabling better comprehension. 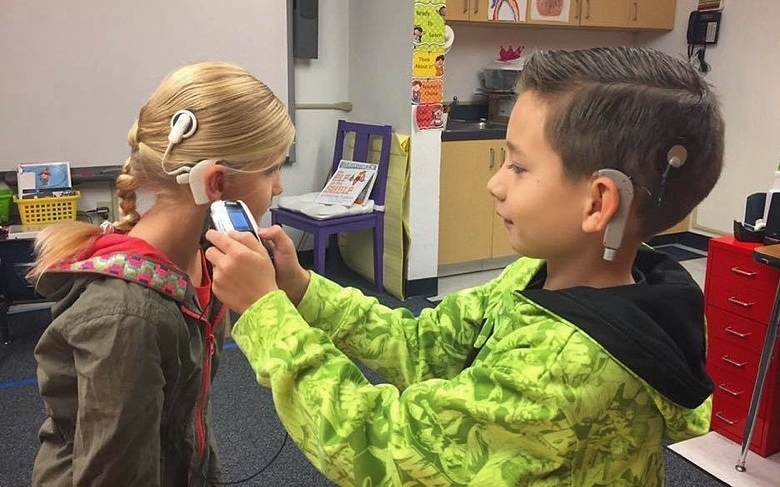 Cochlear implants work a little differently, and this type of assistive technology is most common in children with severe to profound sensorineural hearing loss. For those in this category, sound amplification via hearing aids isn’t sufficient. But how exactly do cochlear implants allow children with sensorineural hearing loss to hear better? Inside the inner ear (a.k.a. cochlea) are tiny hair cells that vibrate when exposed to sound waves. These cochlear hair cells convert audio signals into nerve impulses that are then sent to the brain for processing. This is what produces the sensation of sound. Depending on the extent of the hair cell damage, patients can experience near to total hearing loss. However, cochlear implants can help restore some of this lost sensation of hearing. Cochlear implants are tiny electrical devices that are surgically inserted under the skin behind the ear (in the cochlea). A dedicated sound processor is then worn on the outside of the head. This component includes a microphone that captures audio information before converting it into a digital signal. The cochlear implant then converts the digital signal into electrical impulses that stimulate the auditory nerve. This nerve impulse is finally sent to the brain for sound processing, helping to partially restore the patient’s hearing capabilities. In effect, cochlear implants bypass the vibrational hair cells and stimulate the auditory nerve directly. This allows the user to hear much better than they would when using traditional assistive technologies like hearing aids. Does My Child Need Cochlear Implants to Hear? When used correctly, cochlear implants can provide welcome relief by partially restoring the ability to receive and process sound for children who are deaf or hard of hearing. But not everyone is a suitable candidate for this assistive hearing technology. To see if your child might benefit from cochlear implants, CCHAT’s audiologists can perform a diagnostic evaluation to determine the degree and type of your child’s hearing loss. Cochlear implants cannot fully restore hearing loss, but they can help your child receive and process sounds more clearly. Depending on the test results, a combination of hearing aids, audio training and speech pathology may be a better fit. Our trained audiologists can help you choose the most appropriate treatment option for your child. Some children who are deaf or hard of hearing only need a cochlear implant for one ear. For the other ear, they either use a hearing aid or nothing at all. Cochlear implants are best suited for children who are 12 months or older. This is very different from hearing aids, which can be fitted and worn when a baby is only a few weeks old. If cochlear implants are appropriate, we can refer you to an area clinic and surgeon for the actual procedure. The operation is extremely safe – taking anywhere from 3 to 4 hours per ear. 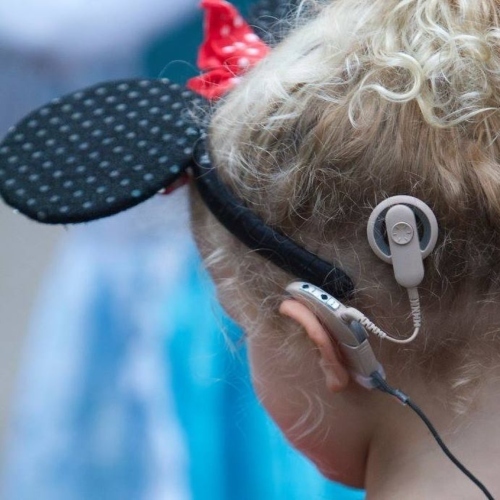 Of the 40,000+ children who have received cochlear implants in the US, the most common side effects include temporary bleeding, numbness, and irritation. Wearing cochlear implants allows children who are deaf or hard of hearing to participate more fully in academic and social settings. A curriculum that has been carefully designed around the needs of children who are deaf and hard of hearing. Since 1996, we’ve helped scores of students matriculate into mainstream school – where they go on to thrive with their hearing peers. A range of pathology services to ensure your child receives the requisite support for natural linguistic development. A supportive community network of CCHAT parents who remain actively involved by hosting workshops, demos, and tours throughout the year. At CCHAT, our goal isn’t simply to help children live with cochlear implants. We want them to excel. If you’d like to learn more about cochlear implants, diagnostic hearing tests or our dedicated curriculum - Schedule a visit with us today.